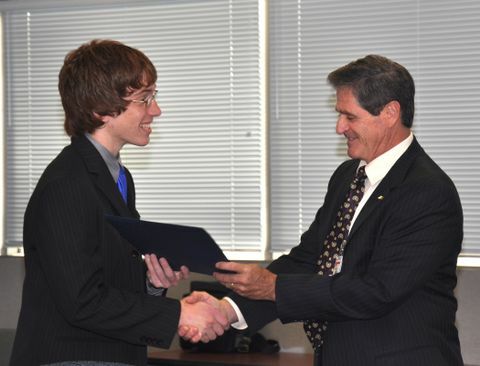 MELBOURNE, Fla., June 17, 2009 -- Eau Gallie graduate Michael J. Lee is one of five East Coast students to win a 2009 Northrop Grumman Corporation (NYSE:NOC) Battle Management and Engagement Systems Division engineering scholarship. 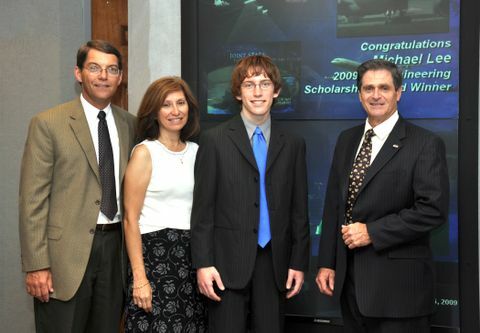 Lee, with members of his family, was honored at a reception at the Northrop Grumman facility in Melbourne last night. This is the fourth year for the competition. For the first time, the competition was expanded beyond the division headquarters in Bethpage, N.Y., to applicants from Brevard County, Fla., and Calvert, Charles and St. Mary's counties in Md. -- areas in which the Battle Management and Engagement Systems Division of the company's Aerospace Systems sector has major facilities. --  Elizabeth D'Arienzo - East Meadow H.S., East Meadow, N.Y.
--  Ryan F. Fleming - St Mary's Ryken H.S., Leonardtown, Md. --  James Troise - Half Hollows Hills H.S East., Dix Hills, N.Y.
--  Charles P. Vasko - Huntingtown H.S., Huntingtown, Md. Lee will receive $10,000 towards his four-year college education -- $2,500 per year over four years. He is attending the University of Florida in the fall. In addition, he will get a paid summer internship at Northrop Grumman's Melbourne facility for the three summers of his four years of undergraduate studies. Including salaries, this scholarship could be worth as much as $30,000. Beyond the salaries, of greater value to Lee may be that he will have the chance to work on real-world aerospace- and defense-related projects as a member of Northrop Grumman engineering teams. On the job, he will be mentored by accomplished senior engineers while bringing his own, fresh approaches to research, development and production programs.